Author Jo Lauricella explains how she was inspired by Harper Lee, the author of the beloved “To Kill A Mockingbird” novel. Lee was born on April 28, 1926 and is well known for refusing to give interviews about her book. 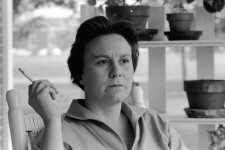 Authors and admirers of Harper Lee and her novel “To Kill a Mockingbird” explain why they love the endearing tomboy character of Scout as well as why they love the exceptional author herself.